In order to give greater First Amendment protection to high school student journalists and allow them to exercise their freedom of speech and of the press in school, Democratic Rep. Will Guzzardi introduced House Bill 5902 on February 11, 2016, to the Illinois legislature. 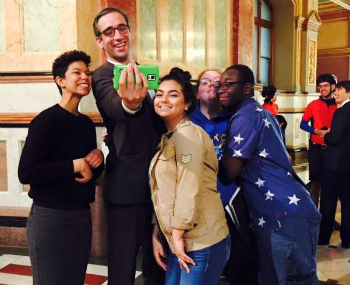 Illinois Rep. Will Guzzardi, posing last year for a selfie with Communities United organizers Sarah Johnson (left) and Jamie Adams (back), and Steinmetz Star 2015 editor in chief Dalia Mena (center) and reporter Brian Geans (right), sponsored the legislation, which is part of the national New Voices movement that already has been passed in eight states. 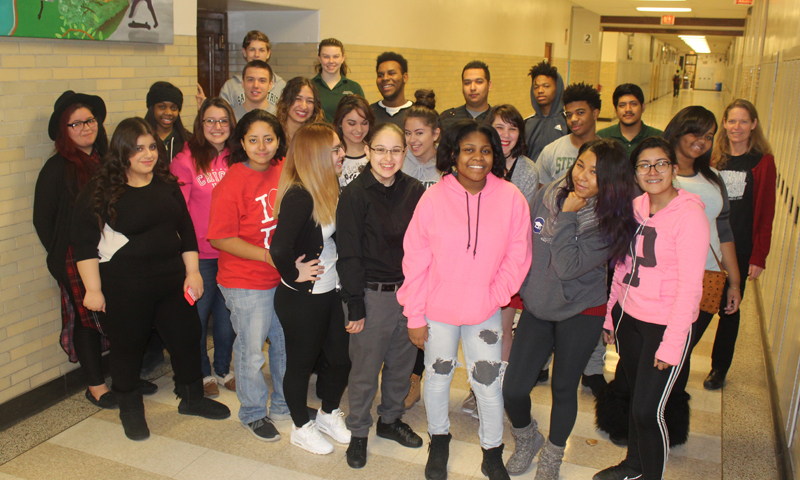 VOYCE photo.House Bill 5902 would do more to protect students� right to determine the content of the media than students currently have under the 1988 Supreme Court ruling in Hazelwood School District v. Kuhlmeier. Under Hazelwood, high school administrators have the authority to censor school-sponsored newspapers as long as they had a �reasonable educational justification� and the censorship was viewpoint neutral. Steinmetz principal Stephen Ngo invoked Hazelwood when he blocked the Star from publishing its later bell schedule story in the Nov. - Dec. 2015 Star. 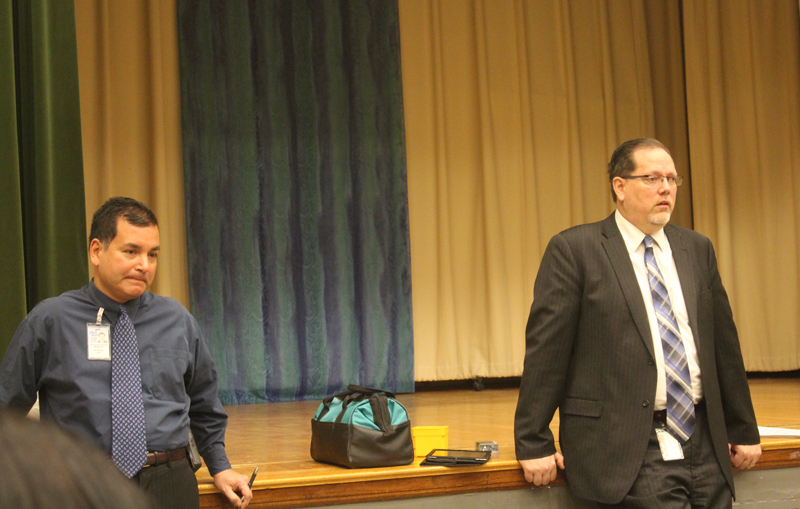 Steinmetz principal Stephen Ngo (left) told Star adviser Sharon Schmidt that her student's story on CPS' later bell schedule at the school, planned for the Nov.-Dec. 2015 Steinmetz Star, couldn't run � three days before he received a draft of the article from students. He told Schmidt the article couldn't run after Network 3 Chief of Schools Randel Josserand (right) "had called him in" he said, after Schmidt had emailed Josserand with student questions. Ngo censored the Star. He told the newspaper�s adviser (this reporter) Sharon Schmidt that the story couldn�t run three days before he even received a draft of the article from students. A week later, after reading the story, asking for and receiving revisions, he still told students the story couldn�t run. The updated story and a response from Mr. Ngo were published in the Jan.-Feb. 2016 Star. Student journalists would be protected from this kind of administrator prior review and censorship under House Bill 5902. The Illinois bill is part of the New Voices Act state legislation, a national movement to restore the Tinker standard of student expression in public high schools (as well as provide protection for public and private college media. The "Tinker Standard" (1967) protects high school student speech unless it is libelous, an invasion of privacy or creates a �clear and present danger,� or a creates a �material and substantial disruption� of the school. The Hazelwood decision (1988) allowed administrators to more easily justify censorship of legitimate speech in "curricular" settings. Under the new Illinois law, the Speech Rights of Student Journalists Act, students would better understand and participate in the freedoms of the First Amendment of the United States Constitution and become more prepared for careers in media. In the current issue of the Star, in which the students' later bell schedule story is finally published, McKenzie Lacefield asks a basic question of press freedom: "We had the information, so why not share it? "Eleven states have enacted New Voices legislation: Iowa, Kansas, Massachusetts, Arkansas, Colorado, Oregon, California, North Dakota. California, Washington and Pennsylvania. In addition to Illinois, Maryland also introduced anti-Hazelwood legislation this week. The New Voices USA website publishes a Q and A, explaining the need for student press freedom. Q: Why is New Voices important? A: Censorship is detrimental for students and society. Punishing students for their speech teaches them that censorship, often arbitrary and without limits, is acceptable. But in a society dependent on journalists and the public keeping the government in check, we cannot afford to have curiosity and confidence bred out of our students. We cannot afford to stifle today�s new voices because they are tomorrow�s media leaders and citizens. Substance reporter and Steinmetz Star adviser Sharon Schmidt (right) with some of the students who report stories for the Steinmetz Star. Scholastic journalism fosters understanding. �The world of free speech begins with young people learning to express themselves,� said Sally Renaud, executive director of the Illinois Journalism Education Association.�And thanks to their high school media advisers, many join the adult world thinking critically, with strength and passion. They become adults who use their free speech privileges with a sense of purpose, understanding the power of language and the responsibilities that come with that power.� � New Voices of IllinoisQ: Why do students need freedom of the press? A: Students are the �embedded journalists� letting their communities know how effectively schools are performing. A Brookings Institution survey documents that just 1.4 percent of mainstream media is devoted to education news. If students are not free to disclose the shortcomings of their schools, the public is unlikely to find out. Study after study demonstrates that the only effective way of teaching civics in schools is for students to discuss contemporary political issues � which is exactly what school censorship prevents. Research by the University of Kansas documents that students who work in newsrooms supportive of press freedom report higher levels of civic effectiveness � the belief that they can use their voices to influence public policy. Q: How do New Voices laws work?